It’s hard to find everyday things that are made in USA. For this reason, I’ve been searching for measuring spoons for over a year. 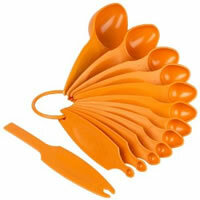 Last week, I found them – Pourfect 12-Piece Measuring Spoon Set. They came in 8 different colors. Each set comes with a leveler and hard to find sizes like 2 tablespoon and 3/4 teaspoon. I like the wide handle, big text, and they are not at all flimsy like the old set I have. Besides the fact that I appreciate the quality, I’m happy to support Pourfect, who manufacture all their products in the States. And I will continue to search for US made products and hope you will, too. This entry was posted in I Found This, Made in USA and tagged kitchen tools, made in USA, Pourfect by n2n. Bookmark the permalink. Thank you so much for posting this! I have been hunting high and low for US made measuring spoons and was beginning to think that I was going to be out of luck until I found your post! Thanks again!!!! I appreciate the feedback! I am glad I could help. It took me a while to find them. US made items are always my first choice when I shop. I was excited to come across this post also….now if I could find a metal or ceramic set made in the USA it would even be better! Lisa, I feel you pain. When I was shopping for these, I tried looking for all available materials but as you know US made ones are hard to find. However, I love visiting kitchen supply shops, if I find them I will be sure to post them. I feel your pain! I blog regularly about the saga (and it is a saga) of finding USA made goods. I settled on the Nordic Ware measuring spoons, they are being shipped from Amazon as we speak. Couldn’t find a *single* stainless set made here! Thank you for finding another option for US made measuring spoons. And yes, it’s sad that we can’t find any stainless steel option. I’m still looking every time I’m in the kitchen stores though. The Nordic Ware measuring spoons look pretty sturdy and the plastic is BPA and Melamine free. If you get a chance after you tried it, would you let us know how you like them?